The peace park in Hiroshima is a beautiful epitaph to pre-bomb Hiroshima. It is home to many monuments, the peace dome and a chilling museum- ensuring the world will never forget. I found it quite eerie to wander around the place the bomb fell. It’s difficult to comprehend the devastation caused by the blast, so complete there is not even a scar. On a brighter note, the park is a beautiful wide open space full of trees and bustling with people- walking the dog, jogging, holding hands. 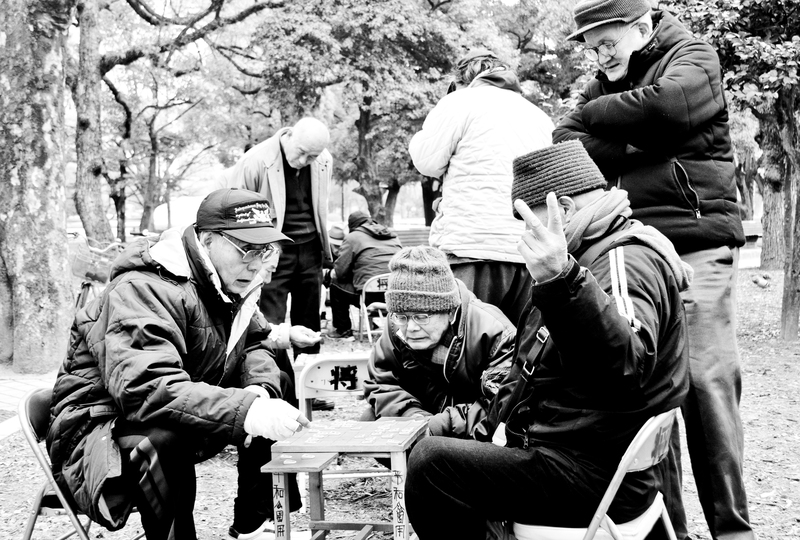 Strolling around, I noticed a group of old men playing Japanese Chess and thought it would make an good candid. I gather the guy to the right in the top photo was not too happy about you photographing him…. I thought it subverted the idea of a peace park. Though, I’m not sure if that is swearing in Japan? Yes, that’s no peace sign. Very good :-). Great capture.